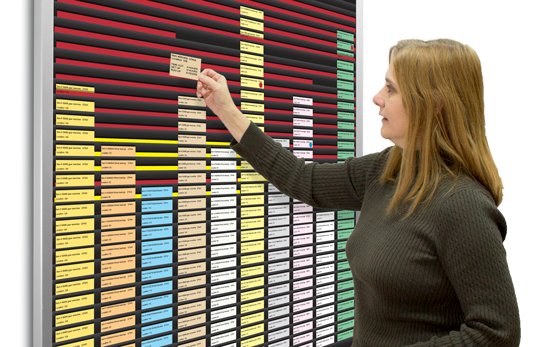 Display Kanban inventory cards in a variety of functional use formats. These boards have simplified and streamlined the critical production communications needs in thousands of our factory client's facilities nationwide. With Kanban boards (a key component of lean manufacturing) you quickly see and manage production and assembly tasks. Also use them to keep track of inventory, stage jobs, and more. Easy to read and always neat and professional, it's flexible style allows for at-a-glance use and quick updates. It's versatile enough for up-to-the-minute changes to production processes or changes to departments and their assigned tasks.